... 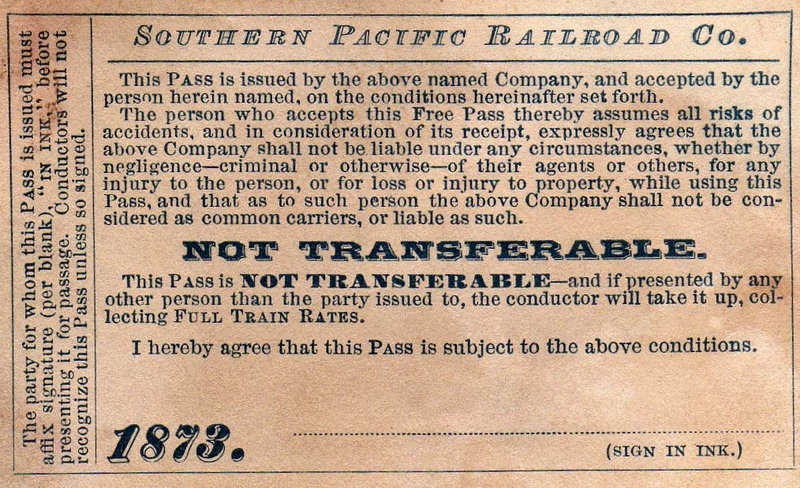 The person who accepts this Free Pass thereby assumes all risks of accidents, and in consideration of its receipt, expressly agrees that the above Company shall not be liable under any circumstances, whether by negligence—criminal or otherwise—of their agents or others, for any injury to the person, or loss or injury to property, while using this Pass, and that as to such persons the Company shall not be considered as common carriers, or liable as such. ... I hereby agree that this Pass is subject to the above conditions. Courtesy Peter and Helen Frusetta Collection.